Halloween is typically the kickoff to the Southwest desert season, and this year Polaris rang it in big with another Camp RZR event inGlamis. Glamis is located in theImperial Sand Dunes Recreation Area which is the largest sand dunes open to off-highway vehicle use in the United States. The dunes begin 10 miles southeast of Niland and stretch all the way into Mexico, over 40 miles away. The dunes vary in width from about a quarter mile at the top end of the Mammoth Wash area, to about 5 miles in width below Highway 78. The Algodones Sand Dune system covers 1,000 square miles, making it one of the largest dune complexes in North America. Glamis is affectionately known to enthusiasts as the Sand Dune Capital of the World and Polaris came back here once again to thank RZR owners with a Camp RZR that had a footprint that was twice as big as last year’s event at New Years. And it is no wonder why Polaris chose Glamis to celebrate. Glamis is the ultimate playground for sport UTVs and it is dominated by RZRs. 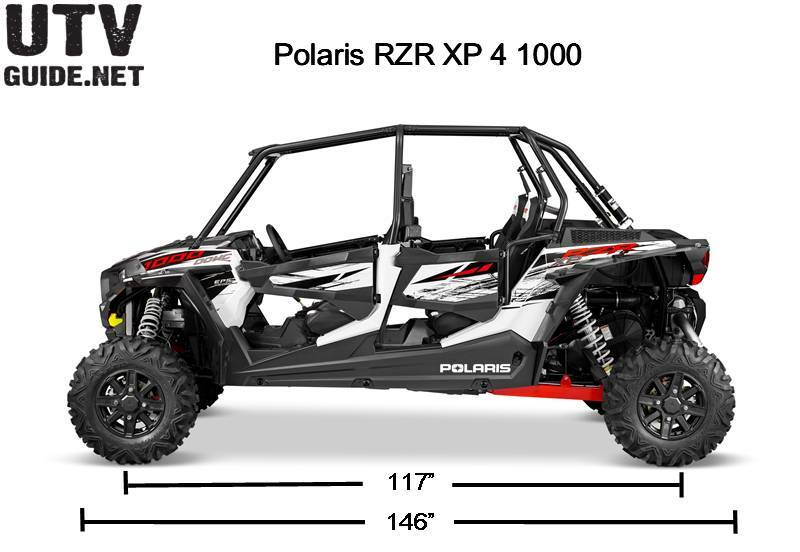 It is hard for me to imagine that it was just three months ago that Polaris introduced the RZR XP 1000. The 1000 was quickly welcomed with open arms by enthusiasts and aftermarket alike at the2013 Sand Sports Super Show, and everyone was eager for the four-seat version to be announced. They didn’t have to wait long as Halloween at Camp RZR was also the location where Polaris invited editors to not only try out the new RZR XP 4 1000, but also send us home with our own demo units! The RZR XP 4 1000 is powered by the same 999cc ProStar Twin-cylinder engine as the XP 1000 that puts out 107 horsepower. Built specifically for side-by-side use, the powerplant features Dual Overhead Cams (DOHC), four valves per cylinder and dual EFI throttle bodies. Polaris claims it is the fastest accelerating four-seat UTV on the market, and from what I felt in Glamis, I don’t doubt that. The XP 4 1000 is 12 inches longer than the XP 4 900 and the wheelbase is 10 inches longer. The XP 4 1000 is quite a bit longer than the RZR XP 4 900, but just a few inches short of the Maverick MAX andWildcat 4 four seaters. Just like the XP 1000, the XP 4 1000 has adjustable seats up front with plenty of legroom. The back seat has decent legroom as well. The suspension on the XP 4 1000 is the same as the XP 1000; 3-Link Trailing Arm Independent Rear Suspension (IRS) with exclusive Walker Evans position-sensitive, anti-bottoming needle shocks. The shocks are sprung and valved for the additional weight, but worked well with just one driver or loaded with four. The extra 27-inches of wheelbase helps keep the XP 4 1000 even more stable in the dunes. The rear end has a much harder time bucking up and the extra length makes ridge transitions even more predictable and stable. it made carving bowls and transitions even more tight and predictable. We found a big jump near Osborne Overlook and a few of the guys went big over a jump. The Walker Evans Racing needle-valve shocks handled the huge air with ease and everyone was impressed with how well the XP 4 1000 flew off the jump. The XP 4 1000 factory-installed quarter doors worked great. Much better than any sort of net configuration. The one-hand operation is easy to use and the latch mechanism is solid with no rattles. The door opening is large so getting in and out isn’t awkward. Front and rear seats are sculpted to help hold you in place during aggressive riding and the front row has tool-less adjusting seat sliders. Cup holders and 12-volt outlets are available in the front and rear seats as well. And it might seem like a trivial thing, but I really like the blue LED light in the front and rear rows. Like all Polaris UTVs, the XP 4 1000 was designed from the ground up with accessories in mind. The XP 4 1000 has integrated mounting points for adding Polaris bumpers, rock sliders and nerf bars in minutes. And with a removable dash, adding switches for electrical accessories is so much easier. I had a blast tearing up the dunes in Glamis with the XP 4 1000 during Camp RZR. The car is surprisingly nimble for its size, and still able to haul four adults through the dunes in comfort. 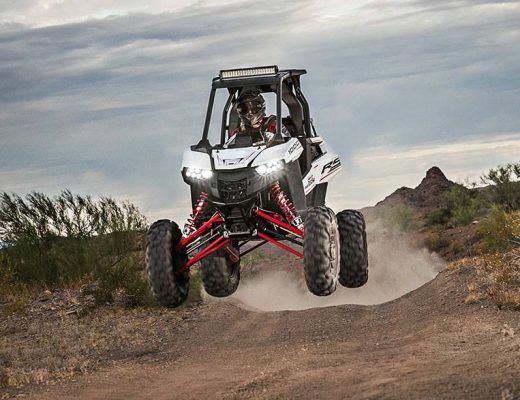 I continue to be amazed with Polaris’ ability to raise the bar year after year. These are exciting times in the sport UTV market. The RZR XP 4 1000 is available in White Lightning and Titanium Matte Metallic. More information about Polaris whole line of Off-Road Vehicle offerings and Polaris Engineered Accessories can be found online atwww.Polaris.com. And at Camp RZR, you didn’t have to be an editor to get a ride in the XP 4 1000. Polaris brought out RZR XP 1000 and RZR XP 4 1000 demo units and put on one heck of a Polaris Experience where you could sign up for a 15 – 20 minute ride through the baby dunes out to Oldsmobile Hill and back.